When we caught Eugene McGuinness earlier this year at Hox to Dot, he had not yet released his amazingly catchy self-titled debut full length, but his brief set left us wanting more. Thursday is the perfect opportunity to acquaint youself with Eugene and his Morrissey-esque vocal range (minus the mope in his lyrics). The guitar pop wunderkind will be playing a Christmas show at the Legion in Hoxton courtesy of Kicker Conspiracy, with Nick Harrison, Gold Teeth and Cosmo Jarvis. Expect charming songs about your cute younger sister, semi-vulgar references to friends with benefits, and Disney references. And who knows, maybe something a bit more seasonal. 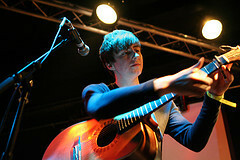 Eugene McGuinness: Thursday 18 December, 8pm, The Legion, Hoxton. Tickets are £6.